Our company supplies Electro Deionization System, which is manufactured from optimum quality raw materials. This EDI system has such features that there is no need for regeneration of chemicals during the regeneration process, which further enables in reducing time and easy handling of risky chemicals. Therefore, we are counted among the famed EDI system Manufacturers and Electro Deionization System Suppliers from India. EDI is the technology, which involves ion exchange and electrolysis processes â�� working simultaneously during the operation. Application of EDI is similar to Mixed Bed unit, as a final polisher to RO or DM plant in USP grade of purified Water Generation Unit. The major Manufacturer of EDI systems are Ionpure and Electropure. Actually speaking EDI is a replacement to Mixed Bed unit as far operation is concern. The advantage of EDI unit is, it produces the water having improvised quality as compare to MB unit, and it does not require any regeneration chemicals for regeneration process â�� resulting in eliminating down time and handling of hazardous chemicals. Electro Deionization unit works on electrolysis process requires electrical energy â�� which is the actual work force to the entire process. The ion exchange resin in the EDI unit is provided as a base material for the removal of residual dissolved solids present in the water. The Resin exchange its functional group with the dissolved ions of the water, like the conventional Mixed Bed unit and thus the water having dissolved impurities are being removed and pure water is produced. The resin has to be regenerated to work further and this is done by electrolysis process. The electrolysis is employed in EDI to dissociate water in to H+ and OH- ion and which regenerate the resin and replaces the dissolved positive and negative ions from the resin â�� which travels toward the electrodes duce to the electrical charge. These ions, which has deposited on the surface of the electrodes are being removed continuously during the process by providing the small (5 % water) stream of the water in the electrode chamber. This stream is called as a reject stream and can by taken back to the feed to RO, so actually speaking EDI works on 100 % recovery without wasting any water â�� called reject stream or reject water. As EDI works on electrolysis principle, it requires 400 vaults DC current and at this current no micro organic survives and EDI produces best quality water with almost zero living organism. Also during the process, due to electrical current water dissociate in to H and OH ions and OH ions are the strongest free radical to reduce the TOC count. 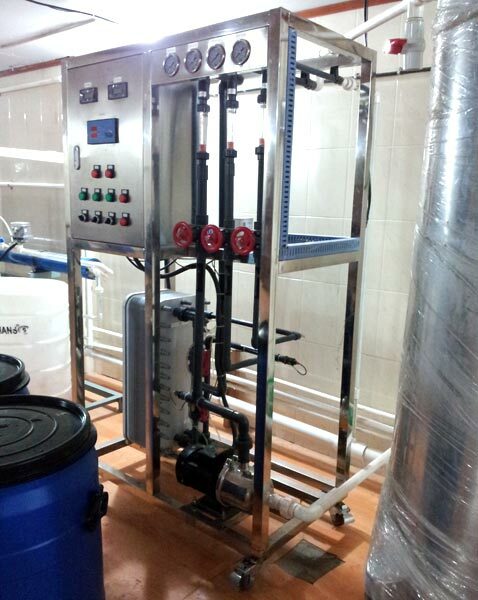 Thus, EDI produces best quality water having minute TOC, TVC, and Dissolved ions.